VANCOUVER, CANADA — (January 17, 2019) Moovly Media Inc. (TSX.V: MVY) (OTC: MVVYF) (FRANKFURT: 0PV2) (“Moovly” or the “Company”) is pleased to announce the integration of Moovly Studio with OneDrive, a file hosting and synchronization service operated by Microsoft Corporation (NASDAQ: MSFT). This integration will allow Moovly users to seamlessly access, upload, and use OneDrive multimedia files in their video creation process in the Moovly Studio. 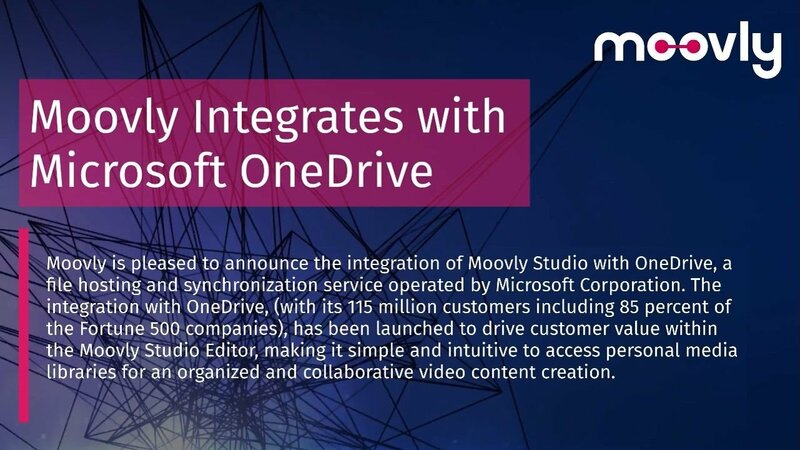 The integration with OneDrive, (with its 115 million customers including 85 percent of the Fortune 500 companies), has been launched to drive customer value within the Moovly Studio Editor, making it simple and intuitive to access personal media libraries for an organized and collaborative video content creation. OneDrive integration leverages the ability to introduce millions of potential new customers to the engaging video creation in Moovly. PreviousPrevious post:Moovly Media Requests Management Cease Trade OrderNextNext post:Why Video is a Must-Have in Recruitment in 2019?